I think XPL HI has generally always produced more lumens than 219C. That’s been the case since both emitters came out in numerous different reviews. XPL HI simply has higher output. More throw too. 219C may pull more amps so the light heats up faster and battery runs down faster, while XPL HI tends to produce more lumens. That was my impression too. But based on Texas_Ace’s tests of the D320 219C and the XPL HI V2 1A, they produce right about the same output at a given current. So with the lower Vf of the nichia it seems like it should output more. Maybe this light has lower bin 219C. I suspect Toykeeper also measured max output on a full cell. It could be that XPL HI starts off with higher output on a completely full cell but due to the higher vF as the cell depletes the Nichia will overtake it in output. Accidental activation almost caused roasted nuts? ….Yikes! Well did edit that part but I guess my point was made except it would have been roasted peanuts, that situation sure was certainly NUTS..
Just the combination I think of those being new jeans and sort of stiff, along with seat belt snugged caused the pocket material to fold up and just press that switch all in under a minute blazing hot, couldn’t even hold the light. I wonder what the people behind my truck were thinking when they see me bailing out of my now rolling truck, I didn’t even have time to put the E brake then at the same time doing a little jig around in the street holding my pocket, probably looked differently to them, and pulling out this massively bright light, man that hurt, must have looked insane I guess.. Still hurting..
Fast-click 10+ times, then click and hold. Light blinks out the current temperature limit in C.
Let go of the button if you want to exit now with no changes. Otherwise keep holding. Light “buzzes” for two seconds. Let go during this time to set limit to the maximum (~70 C). Otherwise keep holding. Light goes up to turbo. Hold until you feel it’s too hot, then let go. The light then blinks out the new temperature limit in C, and shuts off. This way, you can check the current number, set it to maximum, or set a new calibration by feel. Also, setting the ceiling to a high temperature … will hurt. But that’s probably a good thing. Does this seem like a good way to do it? Sure does to me, great work TK, is this in the next release..? I like that it flashes out what it is currently set at so you can check where you left it. XP-L is pretty beast… but I think I’ll go Nichia on this thing. Would be my first floody Nichia and highest amped light. My mouth is watering at the thought. I’m getting pretty close to done. Currently, there is no way to disable mode memory. It’s easy to bypass during regular use, by turning the light on with a long-press or a double-click… but it could be a potential issue when kept in a pocket or a bag if you left it in a high mode and it gets tapped by accident. Making it optional would need some sort of config mode. Adding an actual config mode would require deeper changes and make the interface more complicated. So, I’m trying to figure out if it’s okay to always have memory or if it needs a config mode. I LOVE that UI, thank you for your wonderful work TK ! If there is no way to configure memory mode, how about a long press to memory mode, and single click is on in low mode? While I can flash the ATTiny, I’d much rather see this UI available directly from Richard…. the more I see here the more I want to see it in my shopping cart at mtnelectronics.com. The UI looks great. Well the FW fit on a attiny25? Yes. Hopefully Richard will start selling preassembled drivers in different diameters with this UI. That way we can install it in all our e-switch lights. YES! +1 to this. I have a H02 with a dead driver that I would love to have this set up in. I have the user-configured thermal calibration working. The UI for this is a little more detailed though… Fast-click 10+ times, then click and hold. Light blinks out the current temperature limit in C. Let go of the button if you want to exit now with no changes. Otherwise keep holding. Light “buzzes” for two seconds. Let go during this time to set limit to the maximum (~70 C). Otherwise keep holding. Light goes up to turbo. Hold until you feel it’s too hot, then let go. That is an awesome feature! 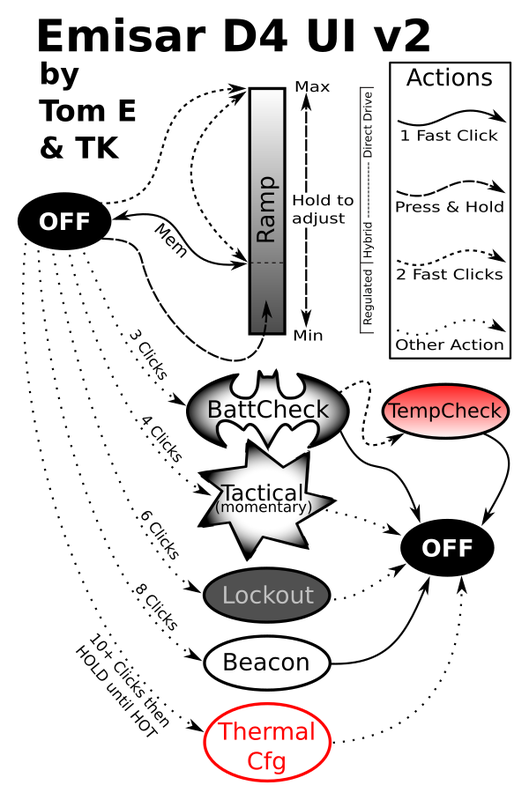 Love the new changes thanks for all your work TK, will ramping output on beacon be also something that transfers to the output of the bat and temp checks light output as well..? Or are they not all connected, I have no clue about coding stuff but I can tell you that the work you do can be very important to someone someday on many levels. Fixed that smooth tube to comfortable hand fit now, feels nice and rubbery and not slippery at all and fells better in diameter. Helps keep heat down from the head as well. There is currently no way to turn memory off. Setting the memorized level is easy though; it automatically remembers whatever you ramp to. I think that’s the plan. Well the FW fit on a attiny25? No, it’ll fit on attiny45 though. It won’t be feasible on tiny25 until I write a whole new code base from scratch… and maybe not even then. will ramping output on beacon be also something that transfers to the output of the bat and temp checks light output as well..? No, the “check” levels are hardcoded at a medium-low output level. Bright enough to read the value, dim enough to not use much power. The momentary “tactical” mode is hardcoded to use only maximum output. For the sort of person who wants a tactical burst mode, I don’t think they’d be happy about having it “burst” at only 30 lm if they had been using the light to look in the glove box a few minutes beforehand. Me, I’d rather have an adjustable momentary mode… but I don’t think I’m the target audience for this feature. Wow this thread goes fast! What did you use for the grip sleeve on your D4? I wish they’d do a run of knurled 18650 body tubes for this light. FWIW, it’s probably not a good idea to add insulation to a hotrod light. It might make the light easier to hold when it’s hot, but … if it’s too hot to hold, it’s probably too hot period. Adding insulation just makes it get hot faster and makes it more likely to damage itself. It needs as much heat-shedding capacity as possible, and a sleeve eliminates an awful lot of surface area. On the upside, with your adjustable firmware he can just set the temp sensor to a good setting with the sleeve equipped. I’m not a huge fan of smooth tubes with no knurling. Lights like that feel slippery. They don’t feel secure in the hand. The ideal solution would be for someone to make an optional 18650 battery tube for the Emisar with knurling. Alternatively, I can try to make a grip sleeve for the light. I did that with my SC63w with good results by adapting a sleeve from a budget light. Solved the grip issue. It does get hotter faster, but because it has a temp sensor it’s not a problem. Or I can use my hand knurler to try to apply my own knurling. This works, but looks like total crap. I’d prefer to avoid this if I have an option. You could try using 3-4 tight fitting o rings. The D4’s tube diameter is 24mm. Wow this thread goes fast! Am I telling the truth here: http://budgetlightforum.com/comment/1155568#comment-1155568 ?